If you’re using a dehumidifier in your house, I’m sure at some point you’ve wondered just how much energy your dehumidifier uses to get rid of high humidity in your house. So the question then becomes, how much electricity does a dehumidifier use? Energy consumption is something that people are starting to become more concerned with. There are several reasons why people are thinking about how much electricity they are using. One of the reasons is that people are concerned with climate change and the environmental impact that humans are having on the environment. Another reason is that they want to avoid high energy costs so that they can save on their monthly bills. If you have been using your dehumidifier regularly, then you might be concerned about how much it is adding to your monthly energy bills. Whether or not it is having a big impact on your energy consumption is likely not readily apparent. It is going to be necessary to do a little research in order to see just how energy efficient these dehumidifiers are. Luckily, it is not going to be overly difficult to figure out. Learning about electric dehumidifiers will help you to understand a bit about how they operate. A dehumidifier is a device or machine that removes moisture from the air. Too much moisture in the air can cause many problems and it has a tendency to make the atmosphere unpleasant for people. Many places are known to have particularly humid summers so dehumidifiers are an absolute necessity in some areas of the world. The way that electric dehumidifiers operate will be very simple to understand for just about everyone. Moisture is removed from the air by cooling a metal surface. The humid air that is present in your home will be touching the metal surface and will be cooled down because of it. Cool air cannot contain as much moisture as hot air so you will start to notice condensation forming on the metal. The condensation is collected in some type of drip bucket or tray. This type of electric dehumidifier design has been in use for a very long time. This is a tried and true way to make things more comfortable for yourself when it is just too humid. Dehumidifiers are also important for people who are trying to protect their basements from problems with mold. Moisture tends to gather in basement areas and it is sometimes necessary for certain homeowners to run dehumidifiers at all times for the sake of safety. If you still have the original packaging for your dehumidifier, then you will be able to see how much energy it consumes. Pretty much every dehumidifier that you will come across will have information on the box. There should be a kilowatt-hour button statistic somewhere on the packaging. This is very useful if you are shopping for a new dehumidifier. It will allow you to choose the most efficient unit and you can make an informed shopping decision. The amount of energy that is consumed by your dehumidifier will differ somewhat from someone else who has a different model. Some models are going to operate more efficiently than others so it is good to take the kilowatt-hour statistic to heart when choosing a new unit. Buying a more energy-efficient dehumidifier can keep your energy bills a bit lower while still offering you the same great benefits. You certainly want to be able to keep as much of your hard-earned money as possible, so it makes sense to buy the best one. Those who are using older humidifiers may need to do some research to determine the energy efficiency of their units. If you don’t have the original box or the manual that came with your dehumidifier, then you should try looking your model number up online. This can help you to figure out information about the product and you should be able to get the kilowatt-hour number that you are seeking. Either way, you’ll be able to move forward and everything will go just fine. How Much Does it Cost to Use a Dehumidifier? The cost of using a dehumidifier is going to be dependent on several factors. Of course, the kilowatt-hour number is going to come into play. It will also depend on how often you use the dehumidifier. There are many people who only use dehumidifiers during the summer months. Some people use them all year due to concerns with moisture problems in their homes. For the purpose of getting an accurate number, this article will assume that you are using a dehumidifier all year round. Most typical dehumidifiers have a kilowatt-hour rating of 280 watts per hour. This makes it easy to determine a reliable number for how much it will cost you to use a dehumidifier all year long. If you were to use your dehumidifier for ten hours every single day, then it would likely cost you about $150 per year. When you look at how much money it would cost to run your dehumidifier for one day, it is only going to be around $0.42. As you can see, it is actually fairly affordable to make use of a dehumidifier. The vast majority of people will wind up being charged even less than this too. These numbers were determined using a rate of $0.15 per kilowatt of energy consumption and some people will have lower rates than this from their power companies. Also, most people don’t have to use the dehumidifier for ten hours every single day. Many people only use the dehumidifier during the summer months so actual costs could be less than half of the quoted number above. It should also be noted that modern dehumidifiers may be more energy efficient than older ones. Older units were not held to the same standards that companies are using today. People didn’t think quite as much about issues such as energy consumption and the environmental impact of energy usage in the past. In modern times, dehumidifiers are made to be as energy efficient as they can be. Many of them will also work more effectively than older units so it may be worthwhile to upgrade. 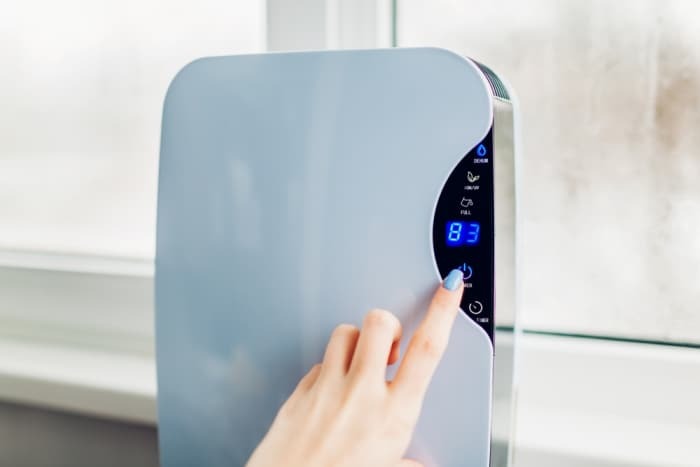 If you are having trouble determining your energy consumption numbers for your older dehumidifier, then it might be time to just go ahead and buy a new one. For the most part, dehumidifiers are going to be very cost-effective. You won’t have to pay out too much money to buy a good one and you will get a lot of use out of it. The modern dehumidifiers can help to make your home more comfortable while running quite efficiently so it makes sense to buy one if you are in need. The most efficient models on the market will be able to use less humidity to remove moisture from the air. You may be able to expect as much as 20% greater efficiency from certain models when compared to the average. This can lead to a bit of savings for you but it will also just ensure that everything works well. If you want a great dehumidifier, then it is going to be a good idea to look into buying an energy-efficient modern unit. You can also decide to limit your use of the dehumidifier to help mitigate costs. Generally speaking, it is not expensive to use your dehumidifier regularly. Even so, some people like to save as much money as possible. If you want to try to limit the amount of time that you are using your dehumidifier, then you can make the decision to use other means to keep your home pleasant while it isn’t on. Simply circulating the air with a window fan can make a big difference when you need to eliminate some humidity. Venting windows and small fans are an excellent way to keep your home feeling comfortable. If you want to avoid using electricity at all, then simply opening the windows can sometimes do the trick. You shouldn’t feel the need to avoid using your dehumidifier too much, though, as it is truly cost-effective to turn it on when necessary. Also, remember that dehumidifiers do not work optimally in colder temperatures. If you are using a dehumidifier for your basement, then you will want to keep the temperature up at a certain level during the winter months. When temperatures dip below 60 degrees Fahrenheit, it can cause problems for your dehumidifier. You may wish to limit its use during the colder months or keep the internal temperature high enough to avoid any potential mishaps. When a dehumidifier gets too cold, it is possible that coils or other parts of the dehumidifier can freeze over. This can wind up causing permanent damage to the unit and this is very troublesome. Most people only use dehumidifiers during the winter in order to prevent problems with moisture in their basements, though. Whether or not you will need to worry about factors such as this will depend on your situation. Modern electric dehumidifiers are very energy efficient overall. They are not going to add a substantial amount of money to your monthly energy bills and you won’t need to feel guilty about using them. Having a good dehumidifier can keep your home feeling more comfortable overall. It can also protect you from potential structural damage if your basement is prone to having moisture issues so it can be absolutely vital. Get yourself the best and most energy-efficient dehumidifier that you can. This will allow you to have a great experience and you’ll always be spending as little as possible on your power bills. There are many amazing electric dehumidifiers out there to consider so don’t hesitate to purchase one if you are in need. As long as you make use of the information and advice listed above, it will always prove to be a smooth experience.